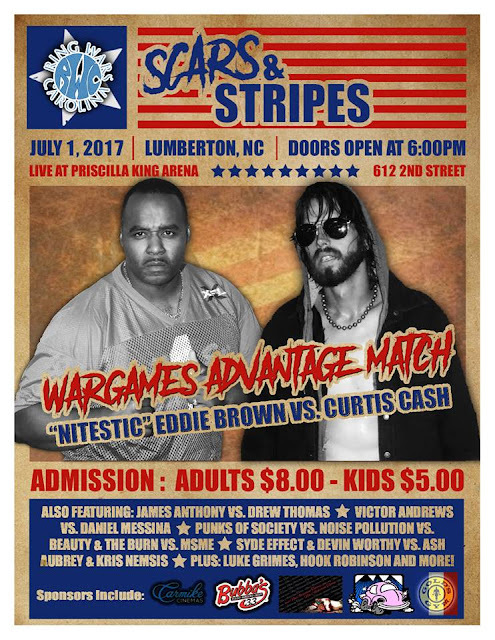 Ring Wars Carolina: Upcoming Event: "Scars & Stripes"
As you probably already have heard, " WarGamez" has hit Lumberton with a vengeance! Eddie Brown & Curtis Cash will pick a team and WAR will ensue! What team will get the advantage of firing the 1st shot? This match will determine just that! Captain vs. Captain for the Advantage spot! No Limitz Champion, James Anthony defending against "The Undefeated One" Drew Thomas! Someone will leave either heavier or Lighter for sure! The Huge 4 way Tag Team match. Punks of Society vs Noise Pollution vs. Beauty & The Bum vs. Manstache MainEvent is gonna be fire! Plus you will see 4 County Champion Devin Worthy, Syde Effect, Ash Aubrey and "The Wild child" Kris Nemesis in action! Special debut by Hook Robinson. All this and more coming to you LIVE July 1, when Ring Wars Carolina presents "Scars & Stripes" 612 2nd street, Lumberton NC doors swing open 6pm and action @ 7pm!